Title: 'Description de las Yndias de Mediodia'. Printed in Spain 1601 / 02. Antonio de Herrera Y Tordelisllas was the official historian of Spain and the Indies. 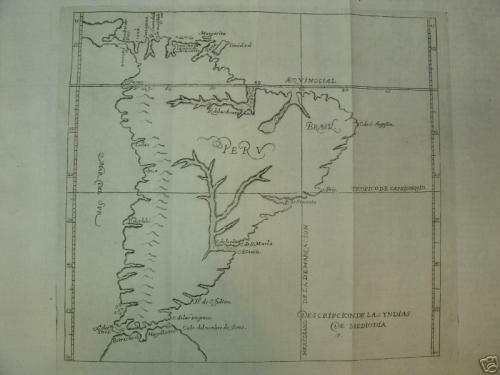 He compiled a history of the Spanish conquests and early explorations in the Americas, which included this simply engraved map of the continent. The map is largely derived from the manuscript charts of Juan Lopez de Velasco. The continent is dominated by the huge "R. de los Amazona" and R. de la Plato" and the western mountain range. The "Meridiano de la de Marcacion", which divided the non-Christian world between Spain and Portugal, is shown. The lack of any great detail on this uncommon map reflects the official policy of protecting Spanish knowledge of the New World. The condition is very good on bright paper with very wide margins.